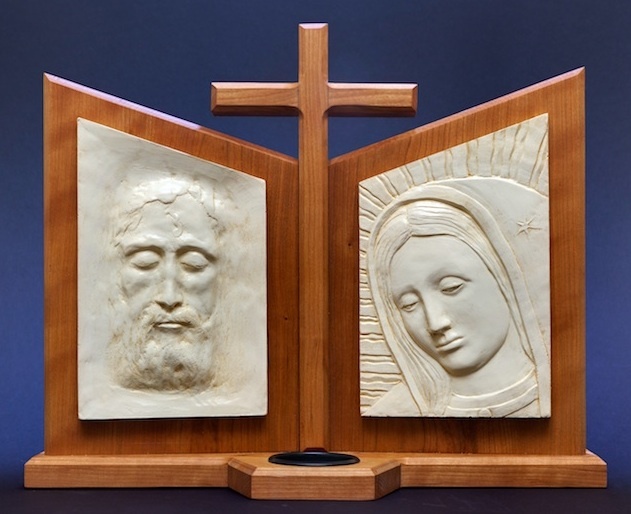 The artist says: "These are reliefs of the Holy Face (shroud of Turin) and the image face of Our Lady of Guadalupe made in Tufstone (sculptural plaster). The plaster is sealed and painted with base coat of ivory and a gilded glaze defines the lines and features. Each Veronikon dyptich is dated and signed and comes with a transferable guarantee of repair or replacement should there be a structural defect in the manufacture for the life of the artist. There is a drip plate recessed in the foreground to accommodate a vigil or tea light. I have a devotion to the Holy Face and when I was ten years old my parents made a pilgrimage from Canada to Mexico to consecrate our family to Our Lady of Guadalupe. So this is a very personal piece for me and I am very conscientious of serving Christ in its making." Happy- Boy finally got to take 'Baby Bee' home from kindergarten! He was so happy that he skipped out of the classroom, singing a merry tune. Big Sister #1 was practically in tears. 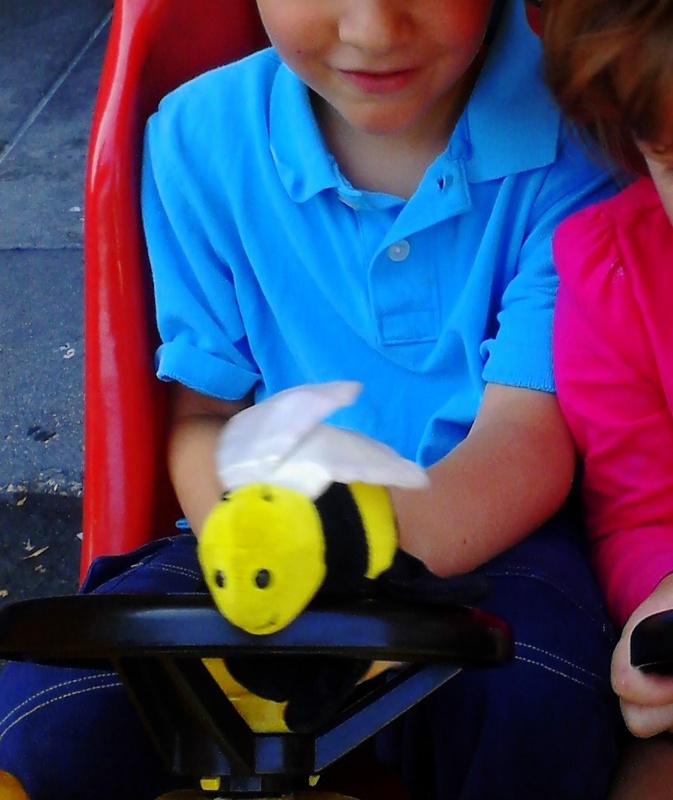 Boy has gotten a blue card every day in kindergarten (basically a communication tool from the teacher to tell parents that everything was fine in class that day), but Baby Bee is for the one child who was extra "kind, caring and careful" that school day. Funny- we celebrated his achievement by going to the park and eating pizza. Baby Bee was there the entire time. I even had to sing the 'night-night' song to Baby Bee after I sang to Boy and Baby Girl. Funny (or maybe a bit crazy)! 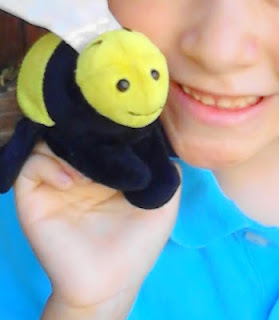 Real- There are 24 students in the class, and yesterday was the 24th day that the bee was given to a student. So this means that Boy was the last to be chosen. Yes, I am that mom. 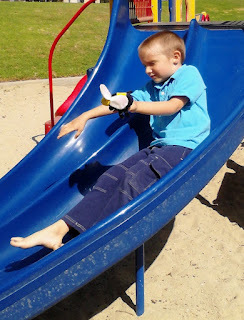 He is just like me- a good student, not a trouble-maker, not always clambering for attention. I am there for an hour and a half once a week, so I know the classmates. 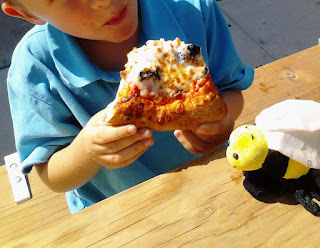 I'm not questioning the teacher when he gave a troubled student the bee because the student finally half-finished a writing worksheet, something my son completes every day with no fanfare. But please, don't tell my son that "you almost got the bee; you needed to be a bit more kind, careful and caring." It can drive one barmy. Peeves such as this are what motivate me to homeschool. I hope he will be fine with 'coming home' next year. Then we will have time for karate and Irish dance! My four grandparents were Quaker with Unitarian siblings, lapsed Catholic, Anglican, and Presbyterian at the time of their deaths. My parents weren't really brought up with a consistent religious upbringing, but my mother was Presbyterian enough as a teen to turn down a dance with Beau Bridges (yes, one of those Bridges) at Hollywood Pres. How my parents got from there to here with all five children married in the Catholic Church with twenty-four or so grandchildren baptized in the Church is an interesting story. As happy as I am to be Catholic and to share the faith with my siblings and their spouses, there are some wonderful things about my Protestant childhood as I experienced it. 4. VBS- luckily with 'CatChat' we now have a fun, Catholic alternative to both non-Catholic VBS and the ultra-serious traditional activities. Sorry, most 6 year olds aren't interested in a week of Eucharistic adoration during the summer. 5. being a hippie- I doubt that we would have gotten into a prayer circle in a public park to pray for John Lennon, but we did back then. I doubt that we anti-abortion pro-lifers would be welcome at a protest of the arms race, but we did that back then. 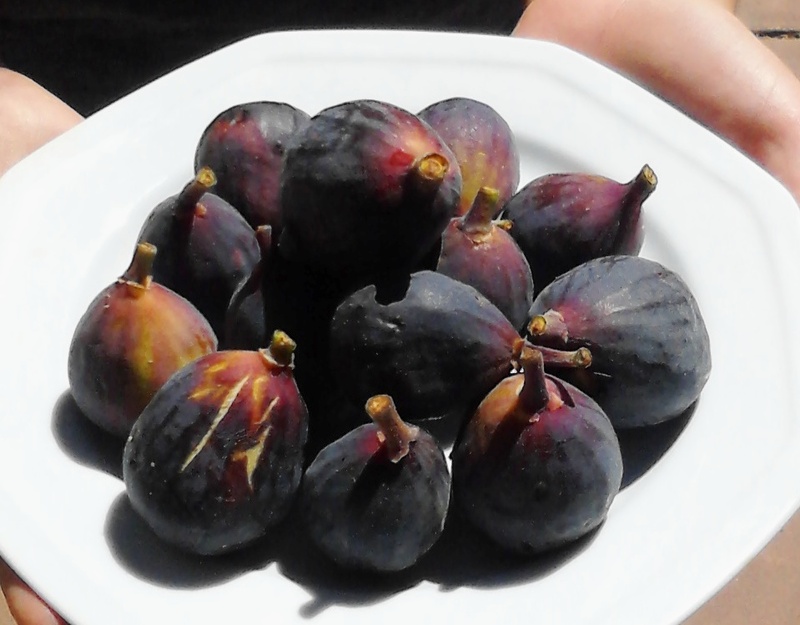 I don't eat carob anymore or make my children call if their host offers soda, but that was then. 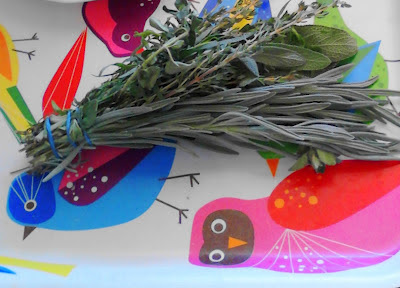 My mother doesn't wear eucalyptus oil as a perfume anymore. I don't now if that would be quite proper at her VOCAL meetings. 6.no fear of hell & no scrupulosity- Perhaps I didn't encounter this in Protestant churches because of my young age. I do know some people who suffer from scrupulosity and 'Catholic guilt.' I just can't understand this. Yes, we are working out our salvation with fear and trembling, but Jesus died and rose for us and He left us His Church and His sacraments! It is a sad thing when a young person fears hell because of not yet being confirmed. 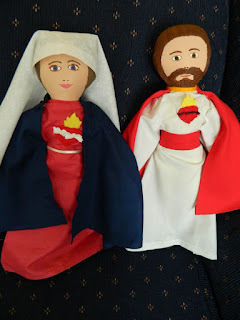 It is also a sad thing that, upon learning that my children are already confirmed, this person wonders if they might go to hell because they don't wear the brown scapular. 7. occasionally not being in church on a Sunday morning- in my childhood, we were always in a church Sunday morning and said a quick family prayer at night before bed. But occasionally, we might sleep in. My children won't experience the 'lazy Sunday' that even devout Catholics can indulge in (Saturday vigil!). In fact, my big girls might go to the 6:30 AM after being at our mission for the Saturday vigil and before going to the 'big' mission in the late morning. Bonus not-so-great thing about my Protestant upbringing: We went to a Quaker meeting between longer stints with the Episcopalians. The Quakers met at the YWCA in town. I remember being in a kids' class to break up the silence of the adult meeting. I clearly remember, at eight years or so of age, being in a room with pro-abortion posters and a big bowl of small neon-colored discs wrapped in plastic. I didn't see anything like that again until my freshman year of college when the '700 Club' (there were 7000 students at my university, and supposedly 10% of the population is homosexual) was trying to force me to accept their anti-AIDS condoms. Anyway, I feel a little bad that I didn't have a consistent moral compass in the churches I was a part of in my early childhood- luckily, we were pretty solid family-wise. 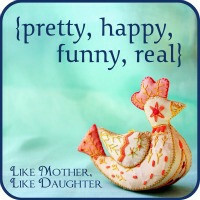 Pretty & Happy- Isn't this the picture of contentment? 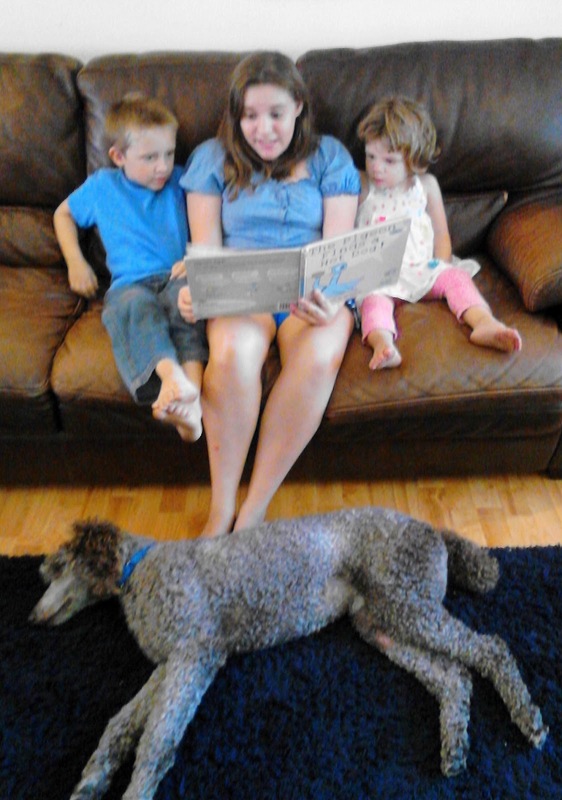 Big Sister #1 is reading a Mo Willems' book to the little kids. All of his books (our hands-down favorites are the Elephant and Piggie series) make great, short read-alouds for the little ones to enjoy. My dramatic big girls love having an excuse to read them aloud as well. Thank goodness Shakespeare class has started up for them again. Real- we don't really have a brisk, crisp Fall like much of the United States. A new strawberry crop was planted across the street yesterday. 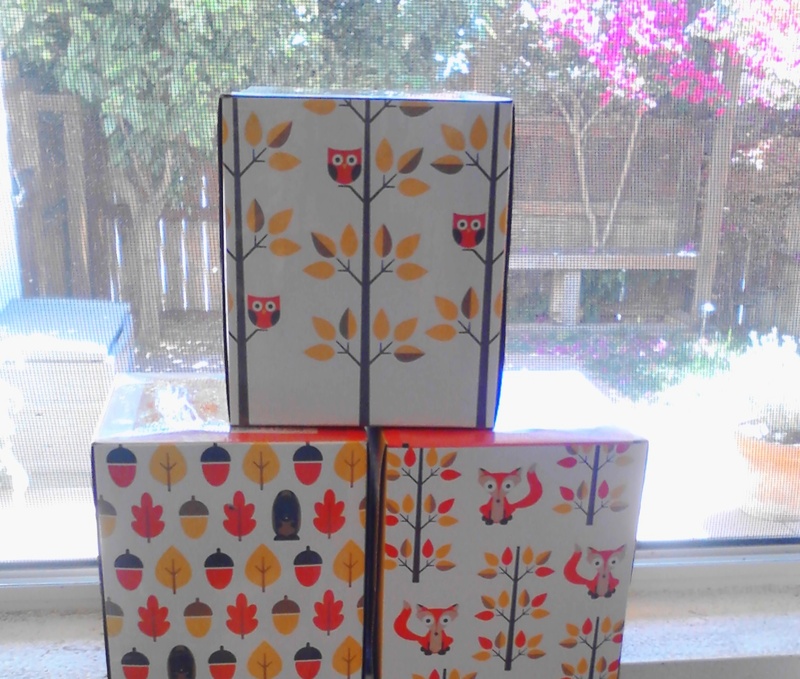 So, poor me, I have to experience the season through, yes, pumpkin-flavored everything and these very cute tissue paper box designs. 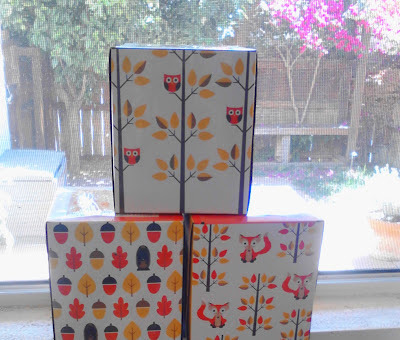 I like the owls the best, of course. 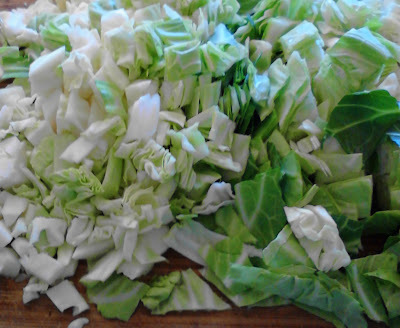 In Romania, every soup (except chicken noodle soup on Sundays) is a 'ciorba' (chore-buh). This means that a bit of souring agent (lemon juice or vinegar) is added to the broth before it is served. If it doesn't have a bit of acid, it is a stew or goulash. In any case, I had the brilliant idea to add my tablespoon or two of white vinegar at the beginning- when I was boiling the chicken bones for the broth. In this way, the acid will cause minerals to release from the bones and make the broth more healthful. While chicken bones from Sunday's dinner are covered with water and are boiling in a large stock pot (add one tablespoon of white vinegar), chop a large onion along with red & green bell peppers. 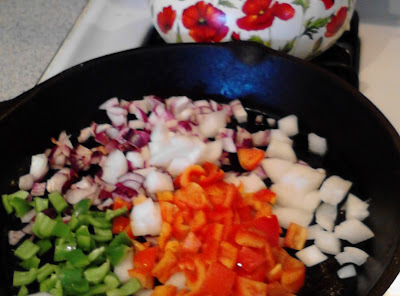 I like to saute my onions and bell peppers a bit before I add them to the ciorba. Add one tablespoon or more of minced garlic. Set aside. In the same frying pan, brown one pound of ground pork or beef. Drain well, then set aside with the onions and peppers. Chop a head of cabbage and place in stockpot with strained chicken broth. Add water to cover if needed. Bring to a slow boil. 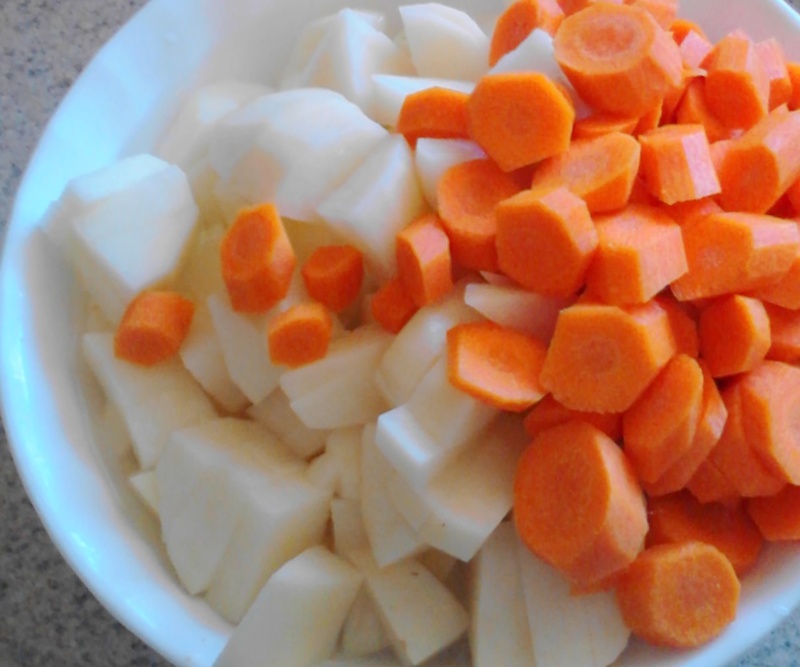 To the stockpot, add four large peeled potatoes cut in eighths along with six peeled carrots cut into coins. Add any other vegetables. I had leftover corn. Add the onion and meat mixture. Bring to a boil. Then cover, and turn to low until dinner time. When it is time to serve, salt and pepper to taste. Add minced herbs and sour cream to each bowl, if desired. Now, why is this soup "almost organic?" All the vegetables are from my weekly box from my Abundant Harvest Organics CSA. It is like Christmas morning each Tuesday when I pick up my box. But I am sorry to say that the meat in the soup is not organic. Organic meat is not in our budget yet. With St Phillip's Fast coming upon us (November15th), we will save money on our food bills and perhaps make room for expensive meat. What is all this about Byzantine Catholics? First and foremost, Yes: we are Catholics in union with the Bishop of Rome (the Pope) whom we recognize as the visible Head of the Catholic Church. We are recognized as being "Catholic" by the local Roman Catholic Bishops and the Bishops of the United States of America and the whole world. Having said that we are "Catholics", we must now state that we are not Roman-rite Catholics, but Catholics who are identified as being Eastern Catholics. As Catholics, we Eastern and Roman Catholics share the same faith and have the same seven sacraments. The difference is that we Eastern Catholics have a distinctive way or 'rite' of expressing our faith in regards to Liturgy and customs. At the Last Supper, after Jesus changed bread and wine into His own Body and Blood, He told His disciples to "Do this in Memory of me." This they did. As the disciples brought the Gospel to different parts of the world, they adapted ceremonies of the Liturgy to the customs and music of that people. In the end, four great centers of Christianity emerged with distinctive Christian customs, but the same faith. These centers were located in the great cities of Jerusalem, Antioch, Rome and Alexandria. A couple of centuries later when the capital of the Roman empire was moved to the Eastern city of Byzantium and renamed Constantinople, an adaptation of the Antioch way of celebrating Liturgy was made. 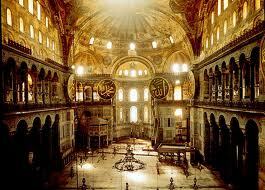 Thus a new center of Christianity arose in Constantinople and her ritual became known as the Byzantine Rite. From Constantinople the Slavic peoples of Eastern Europe were converted by Sts. Cyril and Methodius and naturally followed the Byzantine Rite. • No, Byzantines are their own separate church. "Sui Juris" is often the term used to describe this state. • In Northwest Ohio, Roman Catholic Parishes are part of the Catholic Dioceses of Toledo. • St. Michael Byzantine Catholic Church is part of the Eparchy of Parma (Ruthenian). Can Roman Catholics attend a Byzantine Church to fulfill their Sunday obligation? • Yes! Any Catholic can attend any other Catholic Church to fulfill their obligation. Can Roman Catholics receive communion in a Byzantine Church? • Yes, any Catholic can receive communion in any Catholic Church, whether it is Eastern or Western. • During communion, both the Body and Blood of Christ are given to the person. • Rather than wafers, the Byzantine Catholics use little chunks of bread cut from a loaf, which is usually baked by some of the parishioners. 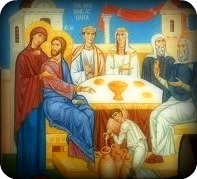 • The bread is put in the chalice with the wine and is gently placed into the person's mouth with a gold spoon. • Unlike Roman/Latin Catholic Churches, Byzantine Catholics do not say, “Amen” after receiving Communion. Should we genuflect on entering a Byzantine Church? • No, the genuflection is of purely Roman/Latin origin. • Instead, we make a “metany” by bowing and making the sign of the cross as our sign of reverence. Why is everyone making the Sign of the Cross opposite than I? How should the sign of the cross be made in a Byzantine Catholic Church? Why is the Virgin Mary called "Theotokos"? • "Theotokos" is a Greek word meaning "God-bearer." It is a title that is commonly translated into English as "the Mother of God." • Because of Mary’s unique role and unique relationship with her Divine Son, she has a special place of honor in the Church. • The Church is awed by the mystery that her womb contained the uncontainable God, and the hymns of the church proclaim Mary to be "higher in honor than the cherubim and more glorious beyond compare than the seraphim. I've heard the term Greek Catholic. What is that? 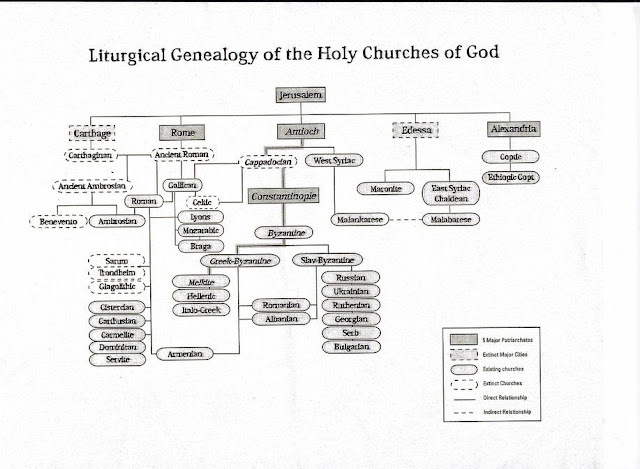 • Historically the Byzantine Catholic Church used to be known as the Greek Catholic Church. • The usage of the word Byzantine became popular, because it helped remove the ethnic stigma that was associated with the term "Greek." • In Europe, the term Greek Catholic is still the norm. 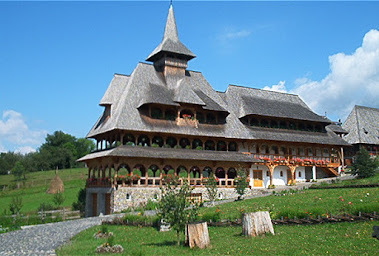 • St. Michael Byzantine Catholic Church used to be known as St. Michael Greek Catholic Church. What are some differences between Byzantines and Roman Catholics? • The Liturgy (Mass) is almost completely chanted (song) and is different than the Roman Mass. • Icons are used instead of statues. • Incense is used throughout the Liturgy. • Byzantine Churches have large Icon Screens which separate the Altar area from the rest of the church. 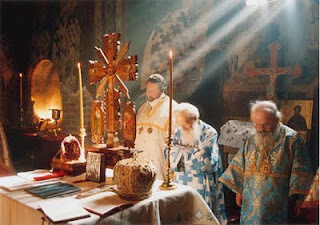 • It is proper to stand during the Byzantine Liturgy as opposed to kneeling in the Roman Mass. • No. 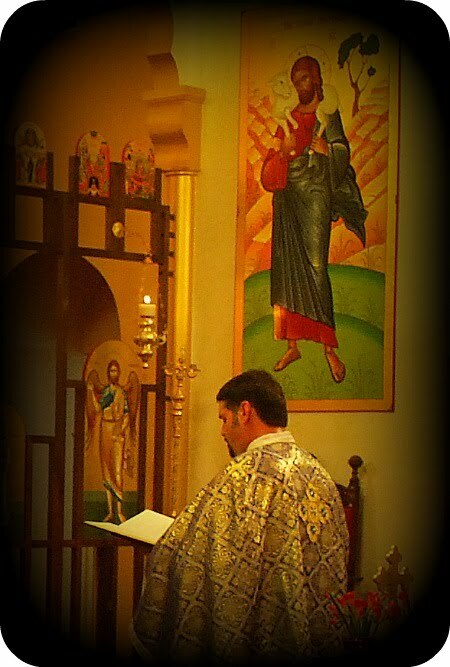 We use the Liturgy of St. John Chrysostom, which dates back to the 300's. I've heard the terms Melkite Byzantine, Ruthenian Byzantine, and Ukrainian Byzantine uses. What's the difference between them? • In essence, there is little difference. The main difference is their ethnicities. These sub-branches of the Byzantine Catholic Church are known as Jurisdictions. • Ruthenians are from the Hungarian and Slovakian regions of Eastern Europe. St. Michael Parish is of the Ruthenian Byzantine Rite. • In the USA, the Ruthenians' church is the largest Byzantine Jurisdiction and has become a melting pot of different nationalities. • Melkites are made up of Arab ethnicities. • Ukrainians are from the Ukraine. In Canada, the Ukrainians have a strong presence. I'd like to become a Byzantine Catholic. I'm currently a Roman Catholic. How do I do it? • To attend a Byzantine Catholic Church on a regular basis, you don't have to do anything special if you are already a Catholic. Simply go. • Some people find that they are spiritually fulfilled at a Byzantine Church, and in order to bring closure to their spiritual journey, they would like to be officially recognized as a Byzantine Catholic. This process is known as changing rites. • Basically, the process goes like this: After discussing this with your priest, you write a letter to your Roman Catholic Bishop and the Byzantine Catholic Bishop. In the letter you state spiritual reasons why you want to change rites. At that point they will begin to process the paperwork and will get back to you. • Note that you are not converting. You are simply changing rites. Readers- if you only have a minute to watch these videos, listen to the first two minutes of the third video with Fr Maximos. He is so wise! Catherine Alexander- we miss your videos and hope to see more of them soon! I've been thinking of 'being authentic while blogging' lately. 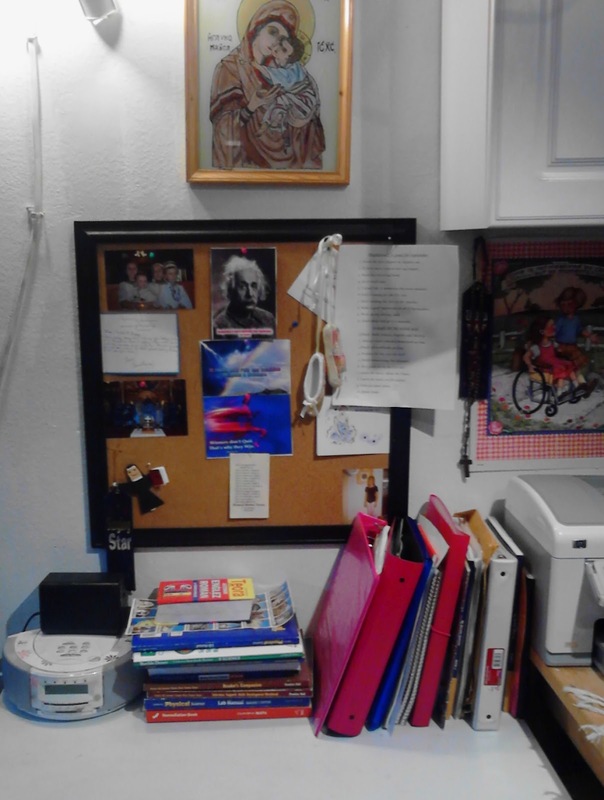 I think that trying to write somewhat anonymously (my family and some friends know about my blog as does a priest-monk who I wish could be my spiritual director)- because I don't speak officially for my eparchy or the Church- makes me seem like a fake. Maybe, you think, this priest's wife is really writing like Suri. No, I would make my life much more interesting if I were not really married to a Catholic priest. Our life is pretty mundane, and it shows in this blog. I'll get over it; I promise: to the commenter who wrote that there is "something not quite right about me" and concluded that it must be because my husband is a "liberal"- No, I think that we all have something not quite right about ourselves; this is concupiscence. It manifests itself in different ways with different people. I suppose bloggers are making their foibles public and are 'asking for' criticism. But then, I could drive myself crazy blogging & trying to be all things to all people. Am I cool enough so that people can see the Church as a viable addition to their hipster lifestyles? Am I conservative enough so as not to scandalize a traditional person (well- the Sound of Music is out)? Am I Eastern enough so that my tradition is better understood? Am I Western enough so as not to alienate the majority of the readers? Does my part-timer job and use of a charter school make me a fake stay-at-home mom and homeschooler? Do the cheese crunchies in my pantry make me a hypocrite after I blogged about health? So, I am going to blog for myself as a sort of journal. 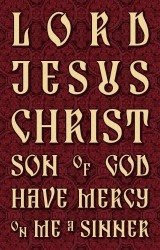 I'm not not blogging for Jesus and the Church, but I don't represent the entirety of the Church (of course) so I pray that all readers see my disclaimer of sorts at the top of the page- "Jesus Christ, Son of God- have mercy on me, a sinner." Life is weird; blogging is weirder. Remember, dear readers, a few months back when a fellow Catholic blogger (who says she is "not blogging for the glory of God") wrote a blog post, since deleted, about how much my blog and my comments at other Catholic blogs irritated her (I'm not going to link, but if you are curious, my post about this would be under the 'disappointed' label to your right)? Well, I got curious lately about her, and I clicked on her profile. It shows her interests and the blogs she follows with Blogger. We almost match completely with interests and blogs we enjoy. So yes, something is 'not quite right about me' if my writing makes me seem like a person this blogger would detest when really we should be very compatible in real life. I'm glad I get along with my sisters, or life would be very lonely (actually they are 1000 miles away, so life is lonely). Please pray for my husband who is under siege at his hospital job. Although I don't have a beautiful life-homesteading-mommyblog with three published books and a magazine like Soulemama, this is a great quotation from Soulemama's blog: "Please do remember that what you see on a blog is not 'all' of a person's life. For me, my blog is a place of daily peace, a reminder of family joys, and a celebration of creativity. 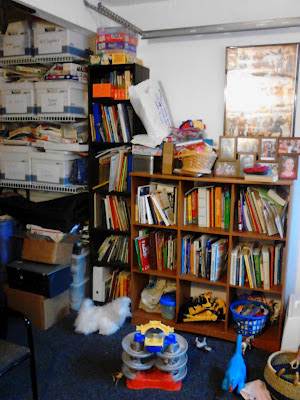 Know that there are as many messes in my house as yours, 'raised voices' from time to time, and frustration and sadness and struggle, too. But for me - this blog space has always been about trying to find and focus on the joys - the everyday beauty and moments of bliss that we have together as a family. It's my hope that it can serve as a reminder and an encouragement to me - and perhaps to you, too - to savor the tiny moments." 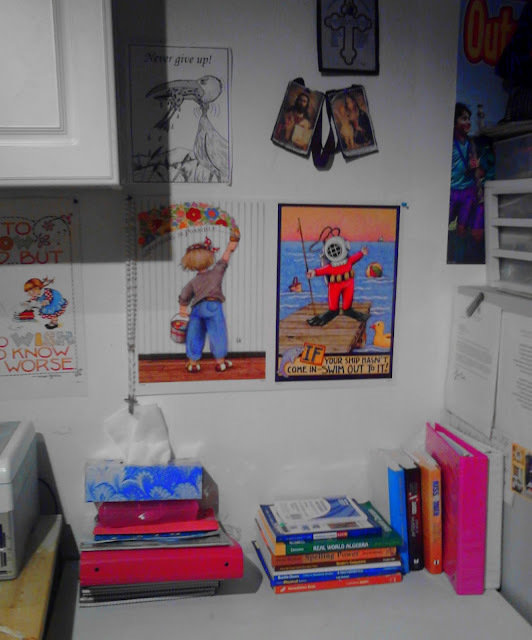 Pretty, Happy- We took the door down two years ago between the garage/school-room/etc room and the galley-style kitchen so it would stop smashing the little ones' fingers. 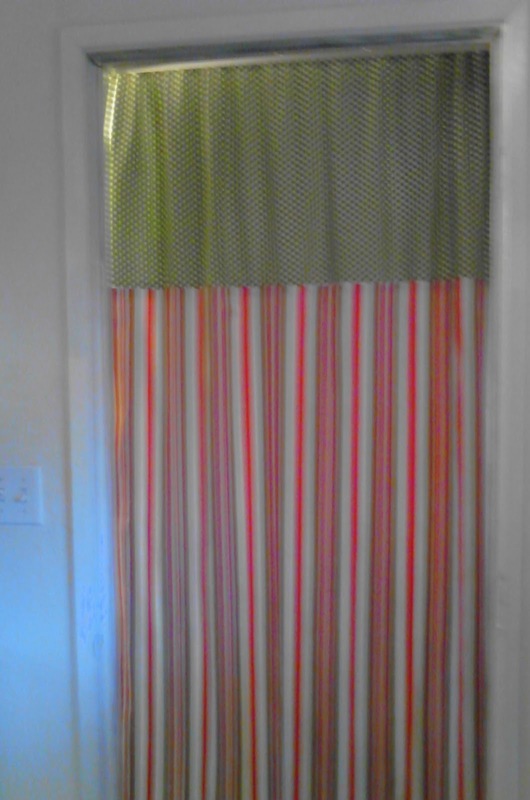 But I finally finished a curtain to separate the two rooms when I don't want guests to see into the garage. it is bad enough that the kitchen is open to the dining area. And I am happy to get the 'etc. room' back to a decent base-line of cleanliness and organization. May it never get out of control again- even though it is not all that in control right now. It is just a lot better. Funny- He's a funny dog. That is all. Real- This is the 'junk' drawer in the kitchen, and yes, that says "this is not your drawer" in all its label-made gravitas. That's not my Playmobile princess, and I don't like bananas enough to eat a dried version of them. 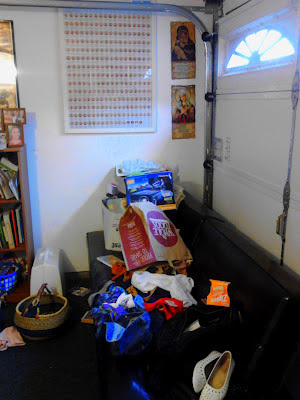 So, the cleaning, decluttering and organizing continues; I suspect I'll never get to the interior-designing part of homemaking. Here's a post that's probably been a while in coming. As a complement to the post I did on how to encourage vocations earlier (there's another, more complete one forthcoming, probably), this one will cover how NOT to do it. First and foremost, I would say, ought to be saying "You might have a vocation!" or things like that. EVERYONE has a vocation. Marriage is a vocation, contrary to popular belief. So is the single life. At least qualify it ("You might have a vocation to the ________!"). Yeah. No pointing out that people have vocations. Next, and possibly most importantly, make sure you know the guy before you say anything. Remember, this is a guy writing this, so I can only speak for myself and presumably for other guys, but something tells me that girls wouldn't appreciate some random stranger telling them to become nuns either. Of course, if you're just going around telling every guy you meet to go to the seminary, that's different and can be quite amusing. But if you're seriously telling someone you just met to go to the seminary, >:( I mean, if one of my friends told me to consider it, that'd be different. Next, don't assume that just because someone knows a bit of theology, he's going to be a priest. One of the things I love about Franciscan is that there, being a theology major does not equate to priestly or religious discernment in people's minds. So the next time someone demonstrates that he has a clue about theology, don't automatically cart him off to the seminary. It's annoying and, personally, I feel that it's counterintuitive. Now, I'd like to mention that this past weekend I was asked what I planned to do with the degree I'd presumably earn in theology and catechetics. That was different. I recommend asking questions of that sort, especially if you don't know the guy. Phrasing it that way is a good idea. Thank you to the deacon's wife who asked. Furthermore, listing all the struggles associated with being a priest is probably unnecessary. Unless you're a priest, it really doesn't seem to me that your opinion is going to be taken seriously. I won't. And I don't remember ever hearing a priest talk about his life only in terms of struggle. Every time I remember a priest generalizing about the struggles inherent in the life, he also included an affirmation of the goodness of said life. So there. Finally (as far as this post goes), on being told that a guy's discerning priesthood (or that anyone's discerning religious life, I suppose), DON'T, and I repeat DON'T, put him on a pedestal. The fact is, it's uncomfortable and kind of annoying. Honestly, I'm not sure which is worse: being discouraged from pursuing priesthood, or being worshiped for it. The guy discerning priesthood is just that: a guy. So no worshiping. Thanks. Priest-husband has bi-ritual faculties for the local Roman-rite archdiocese. This means that he is available to help 'supply' Roman-rite parishes who might be short on help. He regularly celebrates the 6:30 AM (sometimes 8:30 as well. We don't leave for our Sunday mission until 10) Sunday Mass as well as help with confessions and his hospital weekday Masses. So nowadays, people are surprised that he is married after seeing him in a 'Roman' capacity with no wife or children in tow. Not much has changed in the two years since I published the following post. I do feel a bit more hostility and/or desperation from those Catholics who are against the possibility for a married priesthood. Roman-rite Catholics who do not feel comfortable with any married clergy sometimes see my husband as a threat because there are already 10 married deacons at this 'mega-parish' in contrast to 2 priests. Too many married men (and occasionally their wives) are around. 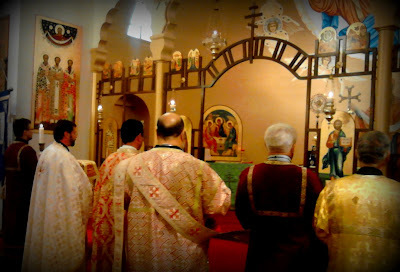 But the silent hostility I feel most is with fellow Byzantine Catholics from a different jurisdiction than mine that does not (or very, very rarely- perhaps sometimes accepting a man from an old country) ordain married men in the United States. Although some are lovely and friendly, most of the believers from this community ignore me- look me in the eye while I am greeting their priest, frown, and remain silent when they are three feet away from me. My married priest husband replaced their priest for almost 3 months over Advent, Christmas, and the New Year 2 1/2 years ago with nary a stipend, but I can't get a nod or smile. Ah well. The legacy of Bishop John Ireland continues. Well, it is certainly unusual for a Catholic priest (of any rite) to be married in the United States. 2. "That's great! Father John Western-rite should get married, too!" Also, priestly celibacy in the Western-rite is a long tradition- as much as married men being made priest is in the East. This tradition should not be treated flippantly with a "married priesthood, why not?" Books have been written on the gift of celibacy, a concept that we in the East also respect with monastic life. 3. "That's great! Are you a priest, too?" Um, no. Not possible. You might find us priest's wives more traditional than the average Catholic. We like our incense, altar boys, and our role as women in the Church. Mary the Mother of God, Martha, her sister Mary and Mary Magdalena all had honored roles in the ministry of Jesus. He didn't make them apostles even though He allowed them to sit at His feet and listen to Him preach. I'll remain in the company of these women and try to serve God by their example. No- and we aren't Anglican, either. The Pope is our boss, and he likes us! 5. 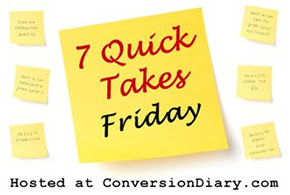 "It must be really burdensome on your church to pay for a family." Yikes! Are you really discussing money with me, a stranger? Well then, I must tell you that my husband receives a stipend (and no living expenses like house, food, insurance, car) from our 'big' mission and not one farthing from the 'little' mission. He supports himself and his family through his full-time job as a certified chaplain. 6. "That's a bad idea; a priest should have only church and God to be concerned with. Your husband can't possibly be dedicated to God, the Church and family. It's just too much." Sometimes it does feel like too much. Like many families with a busy life, we have to be flexible. Frequently we celebrate holidays the day before or the day after to accommodate his schedule. Christmas presents are opened in the evening. With three Master's degrees between the two of us, we live in a small house in one of the most expensive areas of the United States so that Fr. can minister at the two missions. It is not necessarily a good thing, but we have no day off. If Fr. has any time to relax, he'll take the kids fishing or to a movie. While a celibate priest might go golfing with friends or practice another hobby, my husband doesn't have large blocks of time (like a half day) to pursue interests that don't directly correlate to church, work or family. My husband doesn't want to be 'that priest' that didn't take the time to be a shepherd, so he always makes time for parishioners. He answers his calls. No gate-keeper, we are too small. He will celebrate Mass in your home for your anniversary. Homes are blessed at the New Year and when it is requested. As you see, I think he is doing a stellar job. Even though this life is challenging, I think it is a bit like love for our kids. The love grows. It doesn't diminish. Having two big vocations is difficult, but not impossible through God's grace. Pray for him that he fulfills his priestly vocation well! 7. "Is it hard that his vocation to the priesthood is an eternal one while your marriage is only here on earth?" Is it possible that I share in the priesthood of my husband? When we were married, we became one. Then, he was ordained deacon and priest, a priest forever according to the order of Melchizedek. His ordination actually put an eternal mark on his soul while all I got was an overnight, self-led retreat in preparation for this change in my husband and our marriage. I might share in the practical side of his priesthood. I lead singing when I need to and step aside when another person wants to sing. I prepare food for after the services and try to keep my little ones behaving in church. I have supported his priesthood by moving across the country twice, once with a 4-month old baby and a 4-week pregnancy. I try to subdue my feminist tendencies of wanting to be the leader. My husband is the 'important one,' and I wish I could be like Terese of Lisieux who was content to used as a broom and put back into the corner when not needed. There is a huge part of my husband's life that I can never understand or participate in. This is probably the strongest argument against a married priesthood in any rite. We priest's wives cannot fathom the feelings of being at the altar or the confessional. These experiences are hidden from us. God's grace abounds in these situations, but I suspect the evil one is lurking in the shadows, waiting for us to fail. Evil doesn't like husbands, fathers or priests. So it is a lot to say yes to these vocations. All we wives can do is be positive complements to our priest husbands like any wife. Pray for the wives and children! 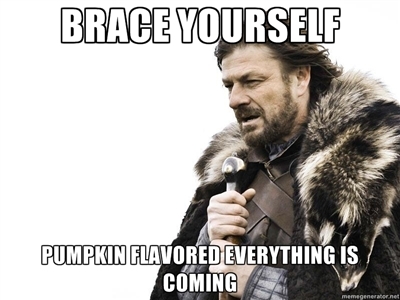 It's the beginning of September. It's time to think about Christmas /Epiphany gifts! Anyone who is interested in a more 'intentional' Christmas season (that seems to be the word on the internet- I prefer 'judgmental'-making judgments about what we want to focus on with our family) that is as fair-trade and as homemade as possible needs to begin now. make a policy about gifts now. Should you all reduce spending (not just for family economic reasons) Could there be a cousin gift exchange? 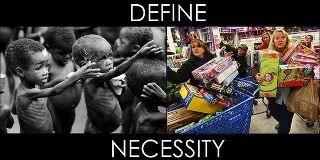 consider finishing up Christmas shopping before Advent begins. For Byzantine Catholics and Orthodox on the new calendar, this means we should be prepared by November 15th. decide how strict your family is going to be about the Advent (penitential) season then the Christmas (celebratory) season. plan an easy children's get-together and a few times to invite friends for dessert (simpler than dinner!) after Christmas day. Send invites out now. This takes care of that feeling of Christmas day let-down that many people feel. click on the label "China" and "social justice" to see where I am coming from- I am trying to become more intentional/judgmental in my buying. look at your closest monasteries and convents. They are sure to sell something handmade as a way to support themselves. please leave your Christmas gift ideas and links in the comments! Me and my 'first-world' problems. I live in a country and time where there are many legal options for educating my children. I am personally blessed enough to live in a place where the public schools are pretty good and some of the alternative and private options are excellent. I stay-at-home most of the time, so I am able to volunteer and be involved in the schooling process. In spite of this, we are choosing to homeschool the children through a public charter school. 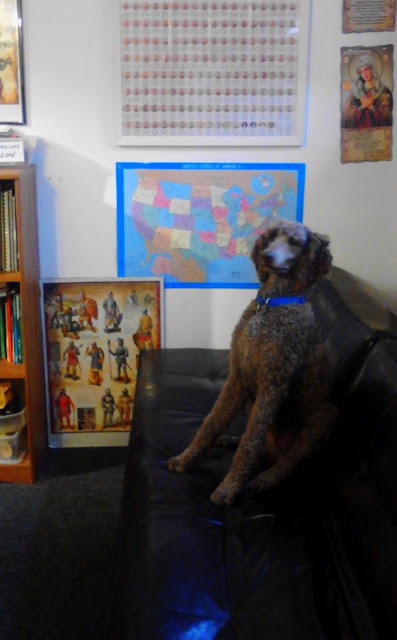 We six people (plus a standard poodle, an outside cat and an inside beta fish) would find this townhouse with a postage stamp backyard just fine if we were gone all day at work, school, and activities. I do hear-tell of mothers who finally have all their children in school and they are thrilled that the house stays as clean as it was for the hours between eight and three every day. But I don't think that the primary problem is being at home all day or having too much (of course, that contributes to the messiness problem). The house is pretty small. 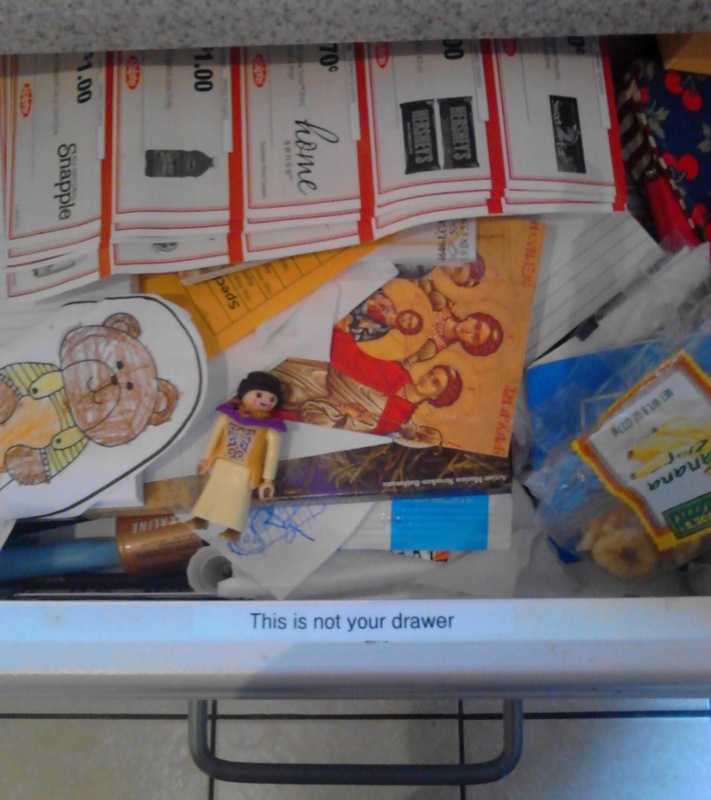 Yes, I know: 'A Place for Everything and Everything in its Place." 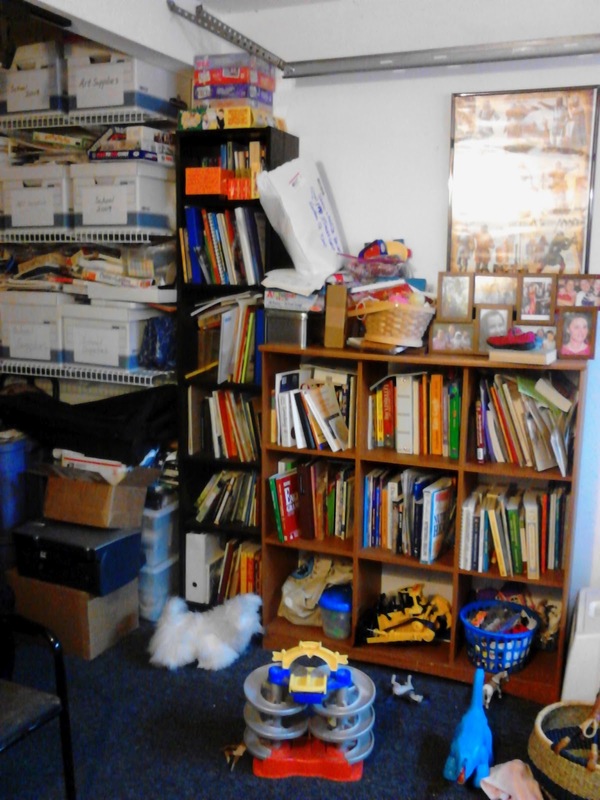 Then should my second pot or the children's bicycles or the stroller or the coffee machine be considered clutter because I don't have the space? Thank goodness I was able to be at a talk by author Laura Berquist who reminded us that if we are stopping homeschooling simply to free up time to clean the house, we should hire a housekeeper and choose to educate our children. There are valid and important reasons to have children in mainstream schools, but housekeeping is at the bottom of the list. 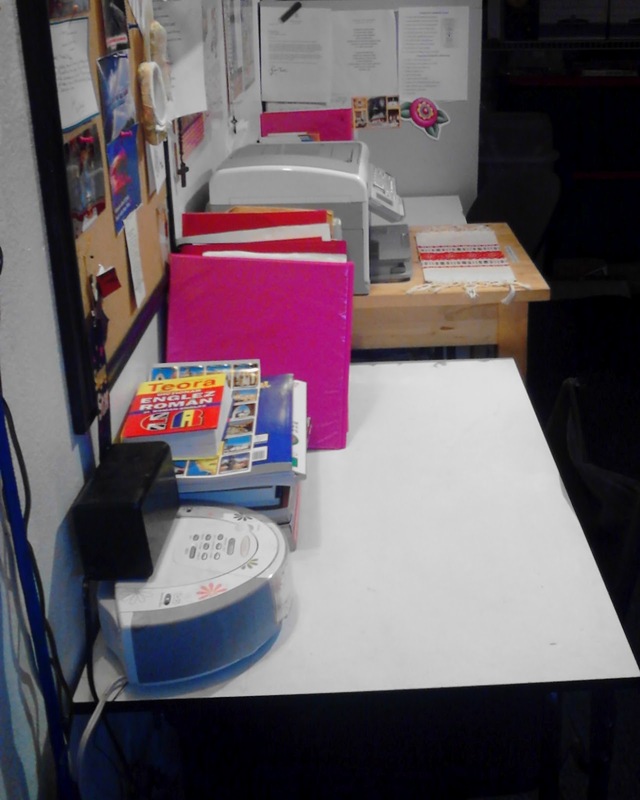 yes, the third photo is a side view of the two big girls' desks, covered in stuff that should be in the pantry and other places. It doesn't look very peaceful or conducive to great academic achievement. 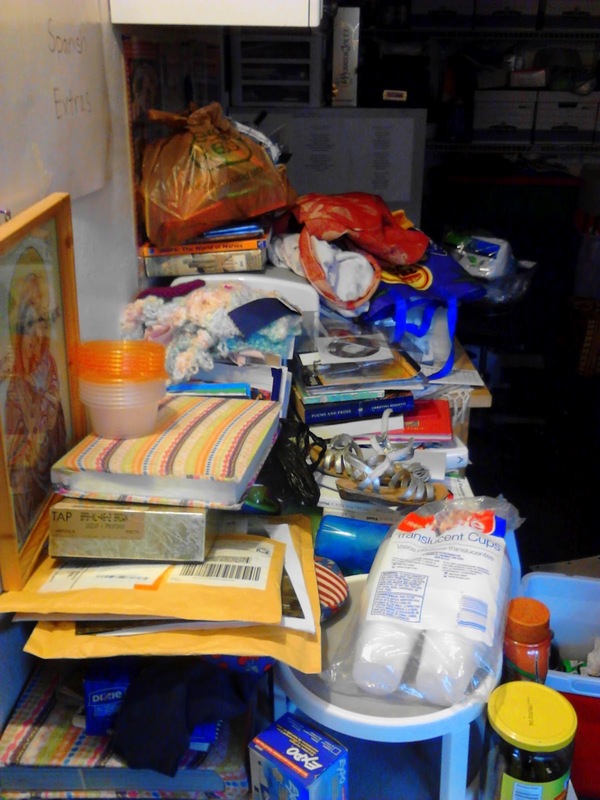 Notice the USCCB envelopes in the foreground. They send a lot of mail. 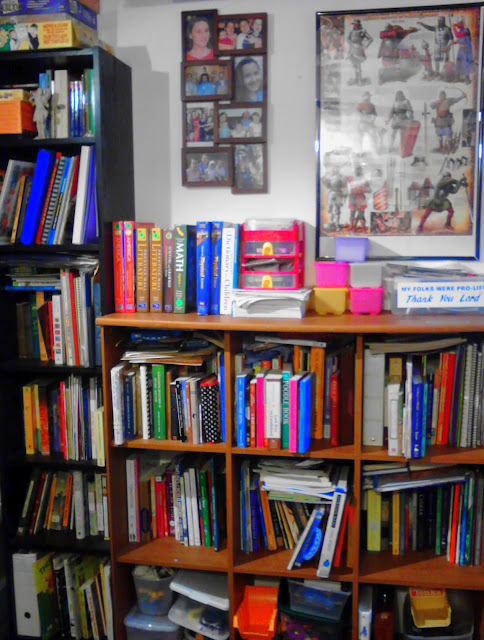 The 'learning room' is already half-better, but I'm not ready to take photos- it will be next week sometimes. And it will never look like the 'Charming' room. At one point in my practice of our Byzantine traditions, I remember a question that someone asked. They wanted to know if our traditions concerning the Jesus Prayer went against the Lord's teachings. The teaching that they were speaking of are in the gospel of Matthew where the Lord says, "When you pray, don't babble on and on as people of other religions do. They think their prayers are answered merely by repeating their words again and again (6:7,NLT).The question that was asked was reasonable based on this passage but this teaching does not represent the way the Jesus Prayer is used in our tradition. What the Lord was addressing was abusive forms of prayer, which in this case meant people who were not addressing God in personal way. There are various ways that our Byzantine spiritual fathers have taught us to pray the Jesus Prayer. Among the teachings of our fathers there is nothing close to what can be considered vain repetition. The fathers were always clear that the goal of prayer is a personal relationship. Anything short of this is vain. For example, Elder Sophrony on addressing centering prayer techniques said, "In diverting our mind from all images, meditation can afford us a sense of tranquility, of peace, release from time and space, but there is no feeling of standing before a personal God. It is not real prayer-face to Face. (On Prayer pg.139)." According to Elder Sophrony's teachings repetitive forms used in the Jesus prayer must oriented toward knowing and loving a personal God. We do not use them to enter states of mind or to somehow manipulate God. As the Elder said real prayer is "face to Face". When oriented properly the repetition used in the Jesus Prayer helps a person grow in their personal relationship with God. However, it's important to understand why we use repetition in the first place. It's easy to understand why we do it but often we lack the knowledge associated with the tradition. First of all, we were created with the propose of loving God for all eternity. Every aspect of what we are was geared toward developing a personal relationship with God, which would include our mind and body. Next, because of sin there was a disorientation in how we were naturally geared toward God. Being obscured the body and the mind were no longer used for their original purpose. Third, in the work of Jesus Christ and his Church we find a way back to what we were originally created for. In the spirituality of the Church we discover various systems that help return the body and mind to their original purpose. In conclusion, There are many forms of discipline in the Church that we use to struggle against are sinful condition. The use a repetition in the Jesus Prayer is way to recondition the body and mind to their original use. Repetition used in praying the Jesus Prayer has taken on many forms in the history of the Byzantine tradition. Many of us know the popular usage that involves inhaling(Lord Jesus Christ, Son of God) and exhaling(Have mercy on me a sinner) a method that's often used in conjunction with a prayer rope. St. Nicodemos in his instructed went a little further with this method in his day. He instructed his followers to hold their breath and say the whole prayer in the mind and then exhale. A method that demonstrates well how the mind and the body are reconditioned back toward God. In this way the mind is disciplined to overcome its tendency to wander in prayer with the body's help. In all the forms that we can find in the history of the Byzantine tradition the goals are always the same, which are to return the body and the mind to the proper use. There really is nothing vain about our use of repetition in our Byzantine tradition if we understand it. The use always involves personal salvation. One of our spiritual fathers demonstrated this in his instruction on repetition of the Jesus Prayer. He said that the prayer must be prayed with the same intensity as one drowning at sea who calls for help(over and over again) with all their might hoping that someone will hear them. Likewise we call out to God focusing all our energy upon the single prayer hoping to seek our own salvation. Unlike someone who is drowning in a sea we know our God is listening. His arms are always reaching down to us ready to pull us into His embrace. It could be said that the repetition that we use in Jesus Prayer is our way to open our arms to God. The tradition of controlling ones breath in prayer as our fathers have taught is one of the most misrepresented aspects of our Byzantine tradition. Many of us have heard the same things: that "we are borderline Buddhists" or that we have "an exaggerated psychophysical symbolism ". One time I had some one send me some Roman Catholic teachings on prayer after they read some of my posts on Hesychasm. He demanded that I stopped teaching it claiming that the tradition is against the Catholic Church. This understanding often comes from a failure to understand the role of the body and how it is an instrument for our salvation, which is a teaching highly developed in the Byzantine tradition. Sometimes in the Western spiritual traditions there has been a lack of understanding when it comes to the role of the body in the work of salvation. It is as if in seeking ways to purify the soul the body has been left out. For example, I heard a teaching around thanksgiving many years ago where there was great emphasis on avoiding lustful thoughts and in the same teaching there was a joke about overeating. It was as if the mind was the only thing in need of purification for salvation. In contrast, in the Byzantine spiritual tradition the body's role in salvation has been fully integrated in every aspect of worship. There is not one liturgy where we don't see constant physical work especially in the Great Canon of St. Andrew of Crete, in which there are constant prostrations. Many saints of the Byzantine tradition have provided many teachings concerning the body. Among them it could be said that St. Nicodemos of the Holy Mountain was one of the most prolific. Based on his writings not only concerning the body but many other aspects of spirituality the saint continues to be source for spiritual renewal in the churches of the Byzantine tradition. This was even more so in his time where he helped bring about lasting renewal in many areas of the church of his day. In my opinion, he should be named as an essential saint that we should look to for the renewal of our churches in our modern time. When it comes to the role of the body we find In the teachings of St. Nicodemos an understanding that many of us are not used to. Often we find a tendency to understand the soul as something trapped or contained in a body, which makes the body of little value when it comes to spirituality . Echoing the words of St. John Damascene St. Nicodemos writes," the difference between a rational and irrational soul is this: The irrational soul is led and ruled body the body and the senses, while the rational soul leads and rules the body and the senses (A Hand Book on Spiritual Counsel pg.69). ".According to the saint the soul is better understood as containing the body making the body truly at its service. However, because of sin there is a disruption in body's relationship to the soul. The body tends to exist for itself leaving the realm of the soul subject to it. Instead of being an instrument that helps develop our relationship with God the body leads us away from him. Understanding the body\soul relationship is essential for understanding Byzantine spirituality. The ascetic disciplines found throughout the Byzantine tradition are for the reconditioning of the body's relationship with soul and in turn God. All too often some of the bodily acts are attributed to being purely symbolic or even psychosomatic. For example, history can attest that there have been at times people in the West who have even accused the Byzantine churches as being those who contemplate their navels, which has been the case concerning the tradition of Hesychasm. However, any bodily action involved in the Byzantine tradition has always been for the ultimate healing of the broken condition that resulted from sin. For most, some of the bodily disciplines of the Byzantine traditions, such as fasting or prostrations, are easily accepted as ways to develop spiritually. However, there is one aspect of the Byzantine tradition that sometimes is met with reservation, which is controlled breathing that is employed in our prayer tradition of Hesychasm. What is often misunderstood as a psychosomatic technique is really a way to subject the body to the workings of the soul and in turn God. In fact, St. Nicodemos demonstrates great insight in how our relationship with God develops through controlled breathing. He writes," The mind, the activity of the mind, is used from a very early age to be scattered toward the external world. For this reason when you say this sacred prayer(Jesus Prayer) do not breathe continually as is natural to our nature, but hold your breath until your inner consciousness has a chance to say the prayer once. By holding your breath even for this short interval the heart is pressed and troubled and feels pain for not receiving natural oxygen. The mind on the other hand is much more readily controlled to return to the heart, both because of the pain and suffering of the heart but also because of the pleasure that is created from this warm and vivid memory of God" (A Hand Book on Spiritual Counsel pg.160). As the saint demonstrates the controlling of breath that we often employ in praying the Jesus prayer is a way to use the body in order to grow in intimacy with God. Byzantine spirituality can be physically demanding. However, undergoing the labor leads to a better relationship with God. Not to be confused with purely symbolic acts the bodily actions found in prayer and worship should be properly understood as ways to develop spiritually. Nicodemos and many fathers of Byzantine tradition can attest to this fact. Also, this understanding is essential for understanding the Byzantine tradition of Hesychasm, which would include the breathing disciplines or even bodily postures associated with the Jesus Prayer. Not approaching this from a Byzantine mindset has led to many in our day to believe that we have a practice that's identical to what can be found in non-Christian religions of the East. This understanding could not be farther from the truth. All though they might look the same the discipline behind it has a different goal and even the structure for its use.